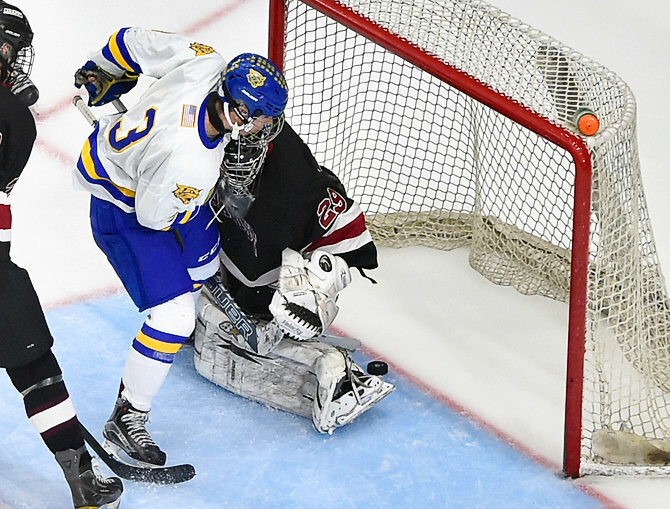 Syracuse, N.Y. —Nerves were at a minimum on the West Genesee bench as Saturday’s Section 3 Division I hockey final against Syracuse headed to overtime in the War Memorial. And, really, when you’ve won eight of the last nine sectional crowns, what’s there to sweat? As Jay Considine showed in this case, really nothing at all. Considine shoveled in a power play goal with 4:28 remaining in the first overtime to give the Wildcats a 2-1 win over Syracuse. The goal came with 40 seconds left on a power play for the Wildcats (19-2), who advance to host the Section 6 champ on March 4 in the first round of the states. Ryan Washo also scored for the Wildcats, while Philip Zollo put in Syracuse’s only tally. Just 1:31 into the extra period, Syracuse’s Matt Eccles was whistled for interference. Considine’s score was set up after West Genesee goalie Sammy Colabufo denied a Syracuse shorthanded chance in his end. Considine gathered the puck in his zone, raced down to the left wing and jammed a shot between the pads of Syracuse goalie Jake Polacek. The goal snubbed a wild attempted rally by Syracuse, which carried play the final two periods and had a late power play at the end of the third period that could have won the game. 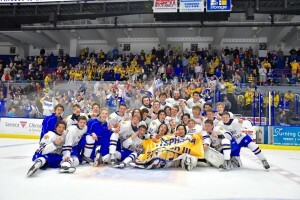 But West Genesee wasted that man-up chance to set up the extra hockey. 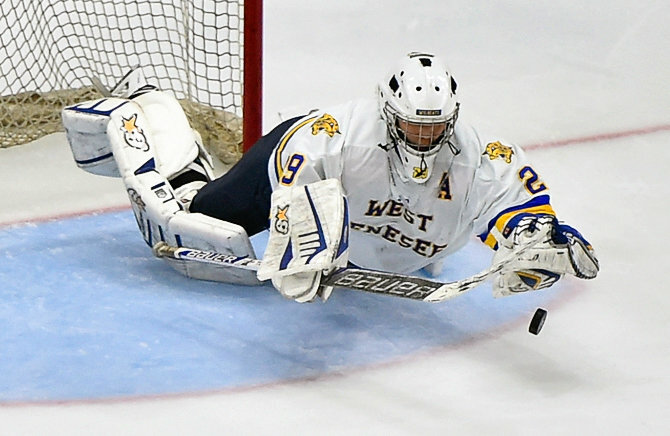 Colabufo made 30 saves for West Genesee while Polacek stopped 26. The Wildcats struck first in the contest, on a goal by Washo with 7:46 left in the first. Zollo responded on a power play score with 8:05 left in the second. West Genesee’s win avenged a loss to Syracuse earlier in the season. The Wildcats now return to the familiar territory of the states, where they fell in overtime to Mamaroneck in last season’s final. “I told these kids before the game we’ve been preparing for this game since we got beat by Mamaroneck 1-0 in the state final,” Frank Colabufo said. “And that’s not to take anything away from the 20 regular-season games, or F-M or RFA along the way. But we prepare for this moment from day one. And these kids have been in the right mindset, the right frame of mind for this game.